This school year, Northern Kentucky students will have unique opportunities to practice skills they will need to succeed in an evolving economy. When asked what he wants to do with his life, high school junior Brendan Martin doesn’t hesitate: “I want to be an aerospace engineer.” His dream may not be typical for a high school student, but it is attainable thanks in part to Kenton County Academies of Innovation and Technology. As students of the Informatics Academy, Martin and his classmates spend their mornings learning computer programming; by the time they graduate high school, they’ll have mastered several coding languages, built apps and web sites, received professional certifications, worked with local businesses and earned up to 30 hours of college credit. The academies are part of a renewed regional and national focus on science, technology, engineering and math – subjects linked to high-growth jobs and usually referred to as STEM. According to a 2010 report by the President’s Council of Advisors on Science and Technology (PCAST), the science and technology sectors accounted for more than half of the sevenfold growth of the U.S. per capita income in the last century, and are expected to continue driving the nation’s economic growth. Locally, healthcare and technology are projected to be among the fastest-growing and best-paying jobs in Northern Kentucky. In the face of such promise, forecasts also show a shortage of qualified workers in STEM fields. In 2011, Kenton County Schools recognized that gap and responded by launching the academies. 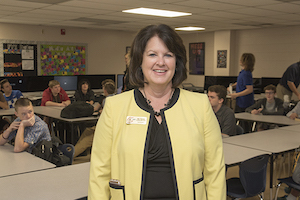 Superintendent Dr. Terri Cox-Cruey says they set out to design a program that doesn’t just pique interest for students, but prepares them for careers that are both in demand and high paying. “It just so happened that, in our region, those jobs are really STEM-based jobs,” said Cox-Cruey. This year there are 10 academies focused on fields such as biomedical sciences, robotics, structural engineering and green energy. Students apply from all three Kenton County high schools, with each campus hosting a few different academies. Accepted scholars spend half of the school day at their academy, learning not just their chosen subject, but integrating academics and career training. This integrative approach is only the second program of its kind in Kentucky. “Where we’re ahead of the game is that we’ve decided to take the math, science and English teachers and intersect them with a career teacher who’s trained in a specific area,” says Academy Director Dr. Francis O’Hara. Amanda Lewis is one such teacher. She teaches informatics, and says the foundations students build in the academies are invaluable. Her classes give students a background in computer science. These foundations don’t always come as a result of traditional, lecture-style classes. Much of the Academy approach is hands on and interactive. This creative, real-world approach is not just growing in Kenton County. In Boone County, the NKY MakerSpace opened in 2015, providing K-12 students with environments for hands-on exploration of STEM concepts. Students can come to the shared space for field trips or workshops to experiment with robotics, computer coding, 3D printing, engineering and more. Fellow junior Autumn Honaker also appreciates the advantage academy work will give her in applying to colleges and studying software security. “The main idea of the academies is to set scholars up for success,” she says. According to math teacher T.J. Palfrey, this happens not just through a focus on STEM subjects, but through an emphasis on real-world skills like critical thinking and project completion. The benefits of the Academy program and an increased regional focus on STEM can be seen not just in student success, but in the success of the local economy. Tailoring education to these areas increases the number of trained workers entering high-growth markets. Thanks to partnerships with local universities, academy scholars discover they can go to college locally and help grow Northern Kentucky’s economy by taking positions with area companies. Honaker sums up the regional benefit by saying, “The academies make young entrepreneurs.” Interaction with local tech companies like Chore Monster inspire students to think creatively, and the project advisory team of industry professionals gives students a built-in network. Far from being an isolated high school program, the success of the academies and the renewed prominence of STEM subjects points back to the growth potential and the needs of Northern Kentucky as a whole.